What is the BHCS Class 3 ? 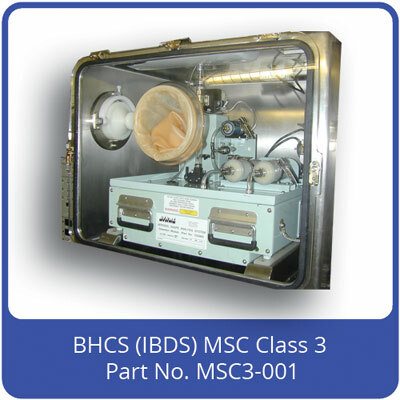 BHCS stands for Bio-Hazard Containment System and is a multi-celled enclosure located inside the IBDS (Integrated Biological Detection System) vehicle. The IBDS is a vehicle borne laboratory equipped to sample and diagnose the local ground, air and water. The system is part of the UK's defence against biochemical threat, and has a fleet of fifty vehicles with the MOD. Quantum Air Technology developed and designed the high containment BHCS for the prime contractors, Graseby Dynamics (now Smith's Detection). The IBDS replaced an earlier system named PBDS (Prototype Biological Detection System, also designed by the same team). The IBDS is capable of rapid deployment to any geographical location where there is suspected use of biochemical weapons. The QAT designed BHCS inside the mobile lab allows operators to analyse samples in complete safety. The BHCS inside each IBDS vehicle draws HEPA filtered air from the vehicle and returns it via a NATO standard composite HEPA/carbon filter. This ensures no hazardous biological or chemical can escape from the detection suite, by filtering the exhaust air and maintaining a negative pressure inside. This negative pressure means that any leaks in the system will be inwards so as not to compromise the safety of the operators. The primary method of isolation and analysis is PCR (Polymerase Chain Reaction). As the system is built into a military vehicle, rapid response to any threat is possible. The utilisation of PCR as a method of analysis means that positive identification of threats only requires an extremely small sample.